For cash back enthusiasts, you can’t ask for a better rewards rate than the Citi Double Cash Card. It awards cardholders up to 2 percent cash back: 1 percent cash back on everything they buy and an additional 1 percent cash back for paying their bill on time. Thanks to this unconventional rewards scheme, the Double Cash card is one of the most lucrative cash back cards available. The Citi Double Cash can even compete with cards with lucrative bonus categories, such as the Savor card. With a flat rate of cash back on every purchase, racking up rewards with the Double Cash card is easy. This makes it a great addition for any cash back lover, especially those who juggle several cards to boost rewards. Tip: To get the most value out of the Citi Double Cash Card, be sure to pay your bill on time each month. Any month you don’t meet the due date, you will only earn 1 percent cash back for your purchases. The biggest downside to the Citi Double Cash Card is its lack of a sign-up bonus. While many cards offer more than $100 for meeting a certain spend threshold in the first few months of card ownership, the Citi card doesn’t have any such promotion. If you are seeking some extra pocket change in the first year, this can be a big drawback. However, the Double Cash card comes with great long-term value that can help make up for its lack of an intro offer. With a generous rewards rate, you can make up the value of a typical sign-up bonus over the first few years. For example, consider the Capital One Quicksilver Cash Rewards Credit Card, which offers 1.5 percent cash back on every purchase and comes with a $150 introductory bonus for spending $500 in the first three months. Thanks to the intro offer, the Quicksilver can outpace the Citi Double Cash Card in the first year. However, in the following year, the Citi Double Cash Card maintains the same value – while the Quicksilver can’t bring in quite as much. In fact, in the third year, you will have earned enough more in rewards from the Double Cash Card to beat the sign-up bonus with the Quicksilver. Once you’ve racked up rewards with the Citi Double Cash Card, redemption is fairly straightforward. You’ll need to have earned a minimum of $25 to redeem, but once you do, you can opt for a check, statement credit or direct deposit into a Citi checking or savings account. Tip: You can also set up a direct deposit into a non-Citi checking account, but you must have paid your Citi credit card bill from that account at least two times to qualify. Unfortunately, the Citi Double Cash Card does not have an automatic reward redemption option, so you’ll have to put in a request for each check or statement credit online or by phone. Rewards earned on the Citi Double Cash Card can also expire if you haven’t earned any cash back in the last 12 months. So if you stop using your card, be sure to cash out to avoid losing your rewards. 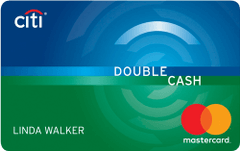 As an added perk, the Citi Double Cash Card comes with a lengthy balance transfer offer. Cardholders receive a 0 percent introductory APR on balance transfers for the first 18 months of account opening (15.74 to 25.74 percent thereafter). Just keep in mind that you’ll be charged a balance transfer fee of $5 or 3 percent, whichever is higher. For cardholders looking to pay down some debt, this is one of the longer balance transfer offers available. However, the Citi Double Cash Card doesn’t include an introductory APR for new purchases. If you are hoping to finance a larger purchase and avoid interest charges for a few months, you might be better off with a card that includes an intro APR on both balance transfers and new purchases – like the Wells Fargo Platinum Visa Card. That being said, the Citi Double Cash Card is a great option for users who want to make a balance transfer to pay down some debt, but still enjoy a great rewards rate once they’ve paid down their balance. Like many cards without an annual fee, the Citi Double Cash Card doesn’t have many extra benefits. Nevertheless, it does come with a few valuable perks that can help you save on shopping and travel. Citi Price Rewind – One of the most valuable perks Citi offers, Price Rewind searches for a lower price on purchases you’ve made in the last 60 days. If the price drops, you can receive up to $200 back per item and $1,000 back per year to make up the difference. Damage and theft protection – If an item you purchased with your Citi Double Cash card is damaged or stolen in the first 90 days, you can qualify for reimbursement of up to $10,000 per incident (up to $50,000 per year). Extended warranty – For qualifying items paid for with your Citi card, you can extend the manufacturer’s warranty by an additional 24 months. Car rental insurance – In the U.S. you can receive secondary car rental insurance coverage for rentals paid with your Citi card. Abroad, you can receive primary coverage, even if you have another insurance policy (maximum coverage of $50,000). Trip cancellation and interruption protection – If you have to cancel or cut a trip short due to illness or severe weather, Citi will reimburse you for qualifying non-refundable purchases. While the Citi Double Cash Card does include some great travel perks – such as trip cancellation protection – it also comes with a foreign transaction fee of 3 percent. Cardholders may find Citi’s customer service lacking compared to other major issuers, such as American Express or Discover. In a recent customer satisfaction survey from J.D. Power, Citi ranked squarely in the middle of 11 other issuers with a satisfaction score of 797. On the plus side, Citi offers 24/7 customer service and an online chat feature that connects you to a live representative, helping you to get a quick response from customer service when you have a problem or question. Since the Citi Double Cash Card earns a flat rate of cash back, it is an ideal choice for pairing with other rewards cards – especially those that offer generous bonus points on certain categories of spending. For example, consider the rewards you could earn if you paired the Citi Double Cash with the Blue Cash Preferred Card from American Express, which earns a whopping 6 percent cash back on U.S. supermarket purchases (up to $6,000 in purchases per year, then 1 percent). If you use the Blue Cash Preferred for all purchases that earn bonus points and the Citi Double Cash Card for general purchases, you can earn a top-tier rewards rate. We estimate the overall rewards rate for this pairing at around 3.07 percent cash back, which brings in around $488 a year on a $15,900 spend. Tip: The Citi Double Cash Card also makes a great pair for cards that earn rewards on rotating bonus categories – like the Chase Freedom. By staying on top of rotating categories and enrolling each quarter, you can earn a higher rate of cash back on certain purchases. Then, you can use the Citi Double Cash Card to boost your rewards rate on all other purchases. If you prefer to use your rewards for travel purchases, the Citi Double Cash Card might not be the best choice for you. In addition to charging a foreign transaction fee, the card doesn’t allow users to redeem their rewards for travel purchases. While you can certainly use cash back to offset travel costs, you might be better off choosing a card with a higher point value for travel redemptions or the ability to book through a travel portal to stretch rewards a bit further. If you want to earn a competitive rewards rate and have better travel perks, consider the Capital One Venture® Rewards Credit Card as an alternative. It comes with a $95 annual fee (waived the first year), but it earns 2 miles per dollar on every purchase and offers extensive benefits for travelers. The Citi Double Cash Card is recommended for users with good to excellent credit (above 670) so you’ll want to ensure you meet those requirements before you apply. Citi also allows applicants to see if they pre-qualify for any credit card offers without a hard pull on their credit. How does the Citi Double Cash Card compare to other cash back cards? The Citi Double Cash Card offers a top-tier rewards rate with little hassle. You won’t need to keep track of rotating categories or differing bonus rates. While it is simple to use, smart spenders might be able to get more out of another cash back card. Here’s a quick look at a few popular alternatives. The rewards rate on the Chase Freedom Unlimited is not quite as high as the Citi Double Cash Card – only 1.5 percent cash back on all purchases. However, the card does include a sign-up bonus, and rewards are much more flexible. You can redeem for cash back, travel purchases or even transfer points to another Chase Ultimate Rewards card, like the Chase Sapphire Preferred® Card – which offers a higher point value when redeemed for travel through the Ultimate Rewards portal. Unlike the Citi Double Cash Card, the Blue Cash Everyday offers bonus categories rather than a flat cash back rate. This means savvy spenders who weigh their purchases carefully can earn more out of the card by using it primarily for purchases at U.S. supermarkets and gas stations. Plus, the Blue Cash Everyday offers an introductory APR on both balance transfers and new purchases – though the intro period is a bit shorter than with the Citi card. The Chase Freedom takes a bit more effort than the Citi Double Cash Card to eke value out of, but it does come with some great perks. You’ll have to enroll each quarter to receive 5 percent cash back in rotating bonus categories (on up to $1,500 in purchases per quarter, then 1 percent). For cardholders who don’t want to put a lot of thought into their spending, this can be a big drawback. If you are willing to do a little extra work, however, you can earn significant rewards by maxing out the cap on bonus categories each quarter. In addition, Chase Freedom rewards are much more flexible and can be redeemed for travel, cash back or merchandise. Like with the Freedom Unlimited, you can transfer Freedom points to another Chase Ultimate Rewards card to potentially stretch their value. Why get the Citi Double Cash Card? You want a simple card that earns a great cash back rate without keeping track of rotating bonus categories. You have a large balance to transfer and want 18 months to make payments with no interest. You are looking for a good flat rate cash back card to pair with another rewards card. Be sure you pay your bill on time each month to earn the full rewards rate. Use the card at least once every 12 months to keep cash back from expiring. If you transfer a balance, make a plan to pay it down in the first 18 months to avoid interest charges. Pair the Citi Double Cash Card with another rewards card that earns bonus points or cash back in particular categories to maximize rewards. Put your major purchases on the card to insure them with Citi’s purchase protections, including theft, damage and price protection and extended warranty. Is the Citi Double Cash Card worth it? For fans of cash back, the Citi Double Cash Card is one of the best, no-hassle options available. You can choose to use it for all of your purchases to earn a highly competitive rate or pair it with another rewards card to boost cash back even further.